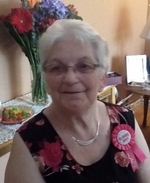 It is with great sadness that the family of the late Cora Marie Buglar announces her passing at the Connaigre Peninsula Health Care Center in Harbour Breton on Friday, March 15, 2019, age 85 years, of Harbour Breton. She leaves to mourn her loving family: daughters, Glenda (Marshall Godwin) at St. John’s, Jessie (Marvin Crant) at Harbour Breton and Denise (Paul Shea) at St. John’s; grandchildren, Peter (Kate), Michael (Norma), Jane (Matthew) and Tomas (Aria); great grandchildren, Jayda, Charlotte, Norah, Spencer, Freddie and Theo; sisters, Meta Bullen and Beryl Rose; brothers, Sidney and Samuel Ridgley; as well as a circle of other relatives and friends. Predeceased by her husband, Fred; great grandson, Noah; sister, Hilda Mary; brother, Reginald. Visitation took place on Saturday, March 16, 2019 from 6:00 pm to 9:00 pm; Sunday, March 17, 2019 from 11:00 am to 4:00 pm and from 7:00 pm to 9:00 pm at Spencer’s Funeral Home. Funeral Service was held on Monday, March 18, 2019 at 2:00 pm from St. Bartholomew’s Anglican Church at Harbour Breton with Rev. Bruce Vallis officiating. Interment followed at the Anglican Cemetery, Harbour Breton.